Our club sent a crew of six members down to Pasadena to help in the decorating of the Rotary's float celebrating 100 years of the Rotary Foundation. The crew had a great time and was able to not only work on the Rotary float but they assisted several other organizations that were short of volunteers. 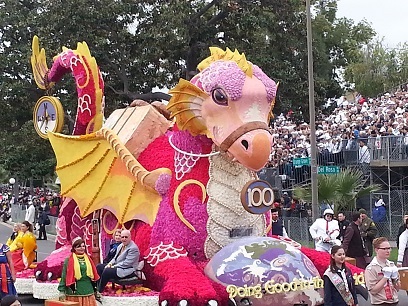 Their hard work paid off as the float received the Princess Award. 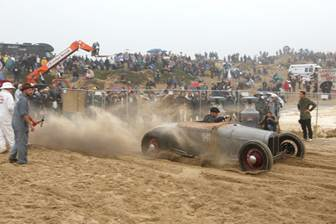 approximately 10,000 spectators spent a wet Saturday watching the races. the clean up by early Sunday afternoon. The Amtrak Station between San Luis Obispo and Guadalupe, the Grover Beach Train Station sits at the west entrance to the city. Besides serving travelers for the Amtrak Pacific Surfliner, the station receives Thruway and Orange Belt stages as well as a South County Transit stop. The Train Station was built in 1996, and in 2015 almost 20,000 passengers used the station. The Rotary Club Five Cities Eco volunteered to clean the facility as one of its charter projects. Besides cleaning up the area under the station roof, removing gum and litter and washing its floor, our crews cover the area picking up anything out of place, trimming plants and pulling weeds. The leaves are collected off the grounds and finally the station and its parking lot are swept clean, using a leaf blower donated by one of our members. The dirtiest jobs, cleaning the restroom and removing gunk form the grounds, has eased since city management and law enforcement razed the grove of trees adjacent to the station leading to the RV park going towards Oceano. There a contingent of vagrants, homeless and others found their haven, and took advantage of proximity to the station lot. Now, with the clean-up of the trees, the Train Station work goes on without the bother of the squatters. From our Club, typically, five-to-seven members are involved each month, volunteering to meet their commitment to Rotary Eco membership. The question: Who was in charge of the medians that run down West Tefft Street, Nipomo? Plants and trees that grew in the two block strip were dusty with grime and existed with healthy patches of weeds within. The eyesores had nothing in the way of care, and Nipomo business owner (and RC5CEco member) Jacqueline Frederick brought the idea of her club helping upgrade the look and maintain the appearance of the road. The idea caught hold, and attracted the assistance of the Nipomo Rotary Club, and together we approached the County of San Luis Obispo to approve our overseeing the project. 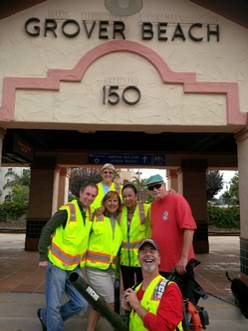 The County supplied us with bags and gloves, our Club supplied the vests, and we started working the medians in late 2013. We've pulled weeds, planted drought-tolerant shrubs, pruned existing flora, and swept and collected litter from around the area. The County erected a sign crediting our Clubs with the maintenance. We consistently work the strips between Vons and Miners on Tefft the last Sunday of every month, meeting at 7:30 a.m. at the CVS store at Mary Avenue. Now faithful volunteer effort has also laid gorilla hair down to prevent weed growth and trees have been removed that blocked sight lines. Not even the weeds in cracks along the medians are safe. 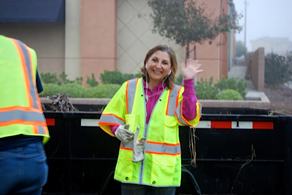 Other work in Old Town Nipomo that has been accomplished by Rotary include watering and clipping the flowers in the hanging pots, cleaning out the creek that runs through Nipomo, and collecting trash along Thompson Road. The old adage invites us to “Think Globally and Act Locally,” and the Rotary Club of the Five Cities Eco did just that in establishing a Monarch Way Station at the Price House in Pismo Beach. Along the West Coast and elsewhere in the country, the numbers of Monarch butterflies following established migration routes have been severely reduced due to loss of habitat through development and pesticide use. 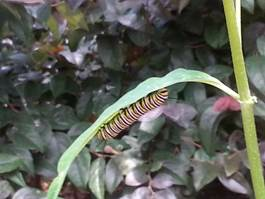 One response” provide way stations by planting milkweed and nectar plants. We gratefully acknowledge the participation and guidance of the Arroyo Grande in Bloom and the docents from the Pismo Monarch Grove. 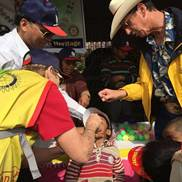 I had the honor of traveling to India on a Polio National Immunization day to represent the Rotary Club of the Five Cities Eco. It was an experience of a life time. I had the pleasure of staying with my host family Arun and Seema Jain in the village of Hathras. This trip was to support the many women in the villages who everyday are out there making sure every child gets the polio vaccine. To give the drops to a child yourself is an unbelievable experience. You know that child will never have polio. This was a life changing experience and I’m so thankful I was able to participate. If ever given the opportunity to travel on one of these Rotary projects do so. You will be blessed beyond your imagination.